By Brendan SonnoneFSU unveiled its new logo and football uniforms Friday. The fan base's initial response to the school's logo change--an altered version of the Seminole head that has been used since 1971--was generally negative when the new emblem was leaked earlier in the month. But the hostility was seemingly negated when fans got a look at the new uniforms during Friday's "Ignition…Tradition" event. FSU had several players model the three new uniforms, which come in white, garnet and black. 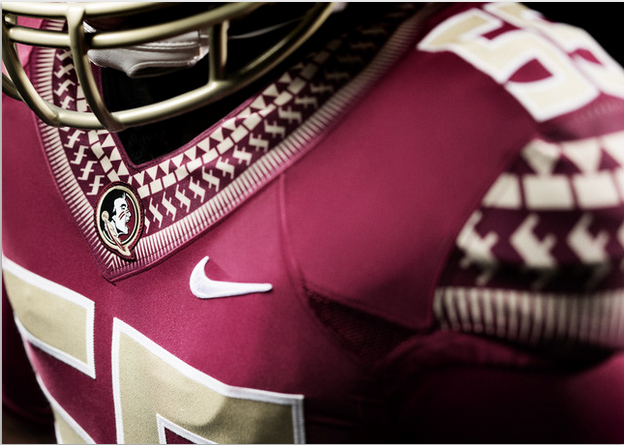 Jerseys and pants were matching colors.And:FSU approached Nike two years ago with the intent of rebranding the athletic department. The school cited a desire to use a consistent shade of garnet for all of its athletic wear and to create a logo that is easier to replicate as primary factors for making the changes. Wilcox said the Seminole Tribe approved the logo change, as well as the additions to the football uniforms, which has the Seminole Tribe's symbols for arrow, man on horse and fire integrated into the sleeves and neckline of the uniform. Comment: I'd say the new uniforms are average. The Seminole or Native-style elements around the neck and shoulders are nice in theory, but they're too small to be seen at a distance. The logo in the center of the chest is also too small. The Nike swish is almost comical. The team is honoring Indians and tradition by selling out to a corporate sponsor. But the real head-scratcher is the spears on the helmets. They reinforce the message that to FSU, Indians are nothing but savage spearchuckers. For more on the subject, see FSU Updates Seminole Logo.